Toledo Correctional Institution is a closed custody prison that houses adult males. Located in Toledo Ohio, this prison houses approximately 1,050 inmates. In 2013, this facility had several inmate deaths, and problems with the management, security and healthcare services at the institution. In the past few years these problems have been addressed and has become a safer and more secure environment for staff and inmates. Inmates at Toledo Correctional Institution can take vocational courses in computer repair and administrative office technology. Academic courses offered at this prison include adult basic education and the ability to earn a GED. The Chaplain's office offers various religious worship services to inmates. Offenders can also participate in community based programs that allow them to perform community service in bicycle repair, caring for dogs, and collecting canned goods for the local food bank. 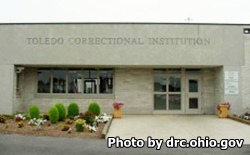 Visitation at Toledo Correctional Institution is by appointment only. To schedule a visit you can call (419)-726-7977 ext. 7552 or you can request the visit in an e-mail, read the directions on how to request a visit through e-mail here. Visiting occurs on Wednesdays, Thursdays, Fridays, Saturdays, and Sundays in two sessions. The morning session is from 8:30am-11:30am (processing ends at 9:45am). The afternoon session is from 12pm-3pm. Toledo Correctional Institution also has video visitation available to all approved visitors through a company called JPAY. You must sign up for an account through JPAY and you are charged a fee for the thirty minute video visit. Visit the JPAY website for more information.